Artists Studio Job customised a Land Rover Defender by adding a golden horn, a tongue and a stained glass window in celebration of the iconic vehicle's sixty-fifth birthday. 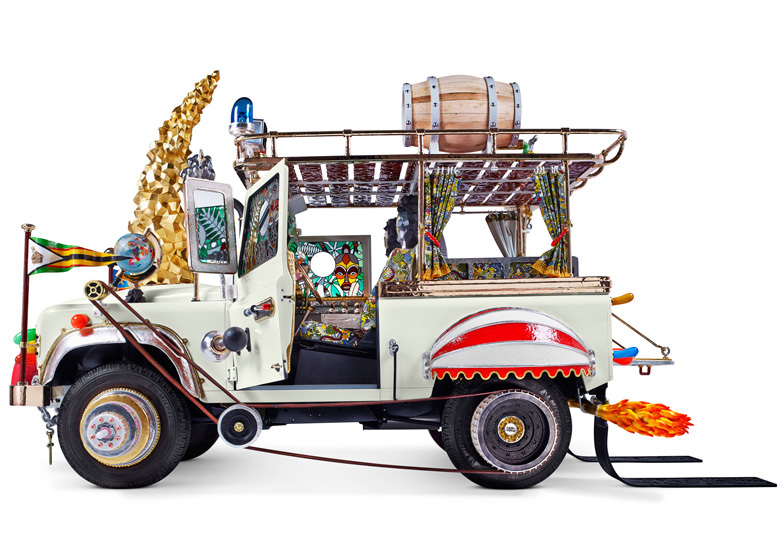 Studio Job took the black four-wheel-drive vehicle, painted it glossy white and embellished it with elements made from bronze, wood, ceramics and other materials to create the Automobile sculpture for Land Rover, which the artists compare to "a Popemobile for an African chief". "It all got totally out of hand!" said the studio's founder Job Smeets. "The moment that black lady entered our workshop, inspiration started to flow out of our ears. One idea after another." The studio looked to the vehicle's different uses, from royal transportation to African ambulances, for ideas and starting points for the add-ons. "Defender is an emotionally charged icon," said Smeets. "On the one hand it's the car that is used in Africa as an ambulance, taxi or agriculture machine; on the other hand it's also the Chelsea Tractor that pampered ladies use to drop their children off at the hockey club. It's used as a fire truck and it's the queen of England's favourite automobile. So, it's a very diverse vehicle." The studio has also layered elements from their previous work, such as bubbles and faceted bronze from the Robber Baron series of furniture the globe used in the scenography for a 2010 Victor & Rolf fashion show. A giant bronze rhino horn was added to the bonnet and a tongue sticks out from the front grille. Flag poles are mounted on the front bumper and fire engine lights sit on the rail around the roof. Three of the wheels have had their rims replaced with a model of the Capitol building in Washington DC, a birthday cake and a pulley cog. The fourth has been substituted for a wooden cart wheel. The interior has been upholstered with African-style prints designed by Studio Job and produced by Dutch textile brand Vlisco, and stained glass windows are patterned with tribal masks and tropical shapes. Studio Job first released images of the design while it was still in progress earlier this year. Now complete, the piece is on display at the PAN Amsterdam gallery until 1 December. Movie is by Dave Hakkens. Land Rover Defender has turned 65. That means this robust cross-country vehicle long ago passed the minimum age to qualify as an old-timer. In order to enhance the vehicle’s history and aura, Studio Job was asked to take this 4x4 in hand. A great car requires a great vision, which in this case carried a certain risk - after all, with Studio Job one ever knows what to expect. In their own way, they have created an ode to the vehicle that makes many of us dream of adventures in distant Africa. Eventually, it has turned out to be more than simply a revised or pimped vehicle. The result is a sculpture that questions escapism, power relationships and above all Studio Job's own work. "Designing a car is the same as when, as a designer, you're sometimes given the chance to redefine a hotel: it's a higher goal. You don't get such important commissions every day," says Job Smeets, who, together with Nynke Tynagel, forms the duo behind Studio Job. "On top of that, Defender is an emotionally charged icon. On the one hand it's the car that is used in Africa as an ambulance, taxi or agriculture machine; on the other hand it's also the Chelsea Tractor that pampered ladies use to drop their children off at the hockey club. It's used as a fire truck and it's the queen of England's favourite automobile. So, it's a very diverse vehicle. We've approached that golden carriage in our own way, maybe not so much from the angle of this one car but rather from the phenomenon of the holy cow in general." It has become a pièce de résistance. The Land Rover has been submerged in a Studio Job "bath", with all that this implies. Like a project that has got out of hand, the Land Rover has been dissected and interpreted, ridiculed and celebrated, laden with stories and adorned with a variety of materials. The motor has remained in place but driving the vehicle is anything but a comfortable experience. One of the four wheels has been replaced by a cartwheel; another wheel has been given a miniature version of the Capitol for its rim. A gigantic rhinoceros stands in all its glory like a golden phallus on the bonnet, and a headlight has been replaced by a candle that hardly gives any light in the dark. The seats have been upholstered in wax prints made by Vlisco, the brand that produces exclusive materials specifically for the African rich. The stained glass windows in turn display magic masks from remote tribes. "As you would expect from someone who knows nothing about making a car, our approach got completely out of hand," says Job Smeets. "The numerous elements kept accumulating. The car literally sticks its tongue out. It wants to be something that it actually isn't. It's become a great concoction, monumental and cynical. But isn't that also true for power and class structures? Those are surely also inventions. A fictive status symbol that other people supposedly look up to. It's also a nudge at designers who are asked to design a concept car and who then invent a stylish-looking apparatus that is launched with all the necessary bells and whistles. So we also take aim at the car industry: I can already imagine the chief sitting in this modern carriage, with the chauffeur in the front and his various wives and children in the back. A Popemobile for an African chief, personalised in a bizarre way."